A new and comprehensive analysis released by the WorldFish Center and Conservation International (CI) has investigated the environmental impact of the world’s major aquaculture production systems and species, and today offers a first-ever global assessment of trends and impacts of cultivated seafood. The analysis has found that, from the 75 species-production systems reviewed, more production means more ecological impact, but that compared to other forms of animal protein production such as livestock, aquaculture is more efficient. 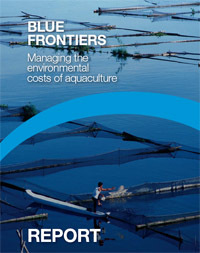 The report, “Blue Frontiers: Managing the environmental costs of aquaculture”, along with a companion policy recommendations paper, was released today in Bangkok, Thailand at the ASEAN SEAFDEC Conference (Association of Southeast Asian Nations, Southeast Asian Fisheries Development Center) on “Sustainable Fisheries for Food Security Towards 2020”. It concludes that the demand for aquaculture products will continue to grow over the next two decades as a key source of animal protein for growing urban populations, and that the industry needs to meet this demand with improved efficiencies and reduced environmental impacts. Among the landmark report’s major findings are two key highlights: (1) the environmental impact of aquaculture varies dramatically by country, region, production system and species , and (2) a review of published information found that aquaculture is more efficient and less damaging to the environment, compared to other animal protein production systems such as beef and pork, and likely to be among the most important sources of protein for human health and nutrition in growing urban populations in many parts of the developing world. Meaning – there is great room for improvement, by identifying and sharing best practices, increasing investment in innovation, and strengthening policies and regulations. Driving the scientists’ research was the recognition of aquaculture as one of the fastest growing food production sectors in the world: it has grown at an average annual rate of 8.4% since 1970 and total production reached 65.8 million tonnes in 2008 according to the Food and Agriculture Organization of the United Nations (FAO). Today, aquaculture is a US $100+ billion industry that now provides more than half of all seafood consumed in the world, surpassing wild-caught seafood. Using all available data from 2008, the study compared aquaculture’s global demands across a wide variety of species groups (13), geographies (18 countries), feed types (5) and numerous production systems in use today, allowing scientists to compare and contrast 75 different types of species-production systems, to determine their environmental impacts on acidification, climate change, energy demand, land-use demand, and other ecological factors. China and the rest of Asia collectively supply an overwhelming majority of the world’s cultivated seafood, at 91% of global supply. China alone accounts for 64% of global production. Aquaculture vs. wild-caught fisheries: aquaculture today accounts for a significant majority of all consumed seaweeds (99%), carps (90%), and salmon (73%), and also delivers half (50%) of the total global supply of tilapia, catfish, mollusks, crabs and lobsters. With the growing demand for animal source proteins, the study also shows that aquaculture is a highly efficient food production system and has clear environmental benefits over other forms of animal food production. Looking toward the future of seafood cultivation, “Blue Frontiers” projects that global aquaculture production will continue to grow at current rates, with conservative estimates of 65-85 million tones produced in 2020, and 79-110 million tones by 2030. By comparison, 69 million tonnes of cultivated seafood were produced in 2008. The report offers multiple recommendations to policy makers, development and environmental organizations, and industry professionals in a companion policy paper. They include: supporting innovation in the aquaculture sector; ensuring the regulatory environment keeps pace and supports environmental considerations in aquaculture development; developing the necessary capacity in national agencies, and careful monitoring of the sector so that support and investment are appropriate to the market opportunities are core recommendations that apply globally but will have regional differences in their relative importance.